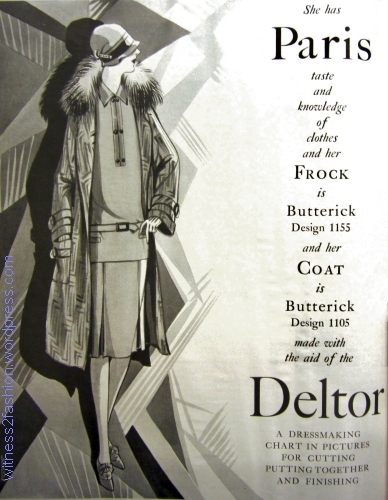 I’m reading Elizabeth Hawes’ book Fashion Is Spinach, (1938) and I’ve reached the chapters in which she describes her months as a copy sketcher in Paris in the 1920’s. That is, it was her job to attend couture showings, posing as an assistant buyer for a department store (Weinstock’s); take careful mental notes (and whatever she could get away with writing on her program;) then rush home to draw the dresses she saw, in order for stores or manufacturers to make unauthorized copies of designer clothing. However, some stores actually purchased the couture they intended to copy. 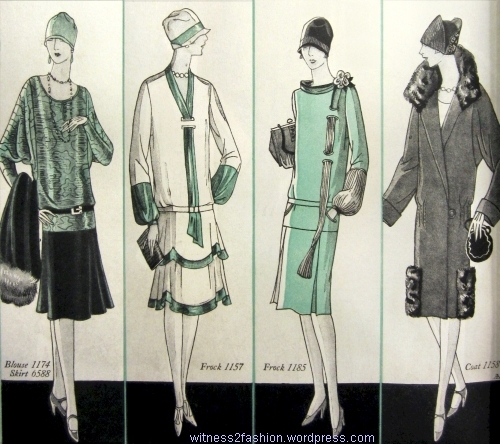 According to Hawes, [p. 55] both Bergdorf Goodman and Hattie Carnegie bought fifty to seventy-five models each season for the purpose of making copies — the couturiers understood this. Not many clients bought that many items. 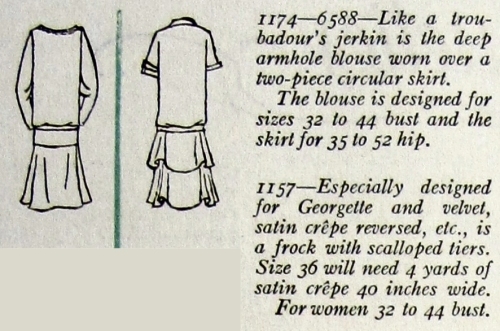 This suit by Paquin could be made to order at Hattie Carnegie in New York. 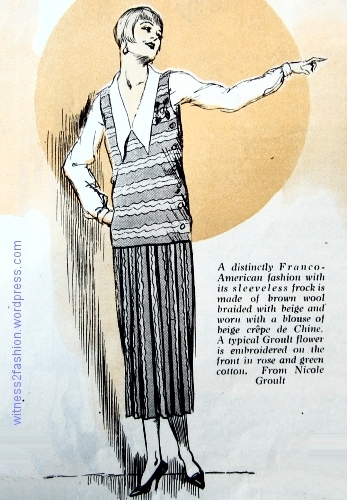 Delineator, Dec. 1926. This very high quality copy of an ensemble by Paquin could be purchased (made to order) at Hattie Carnegie. 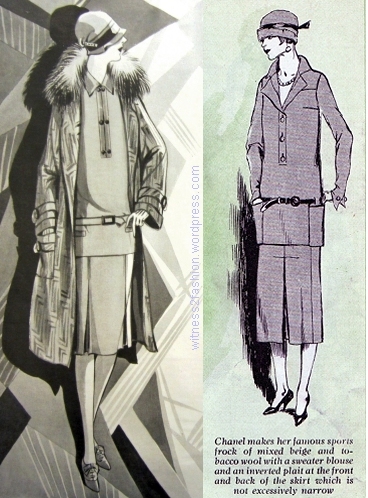 These elegant ensembles are also from Hattie Carnegie, but the magazine did not credit any designers. Hattie Carnegie was also a high-end department store. 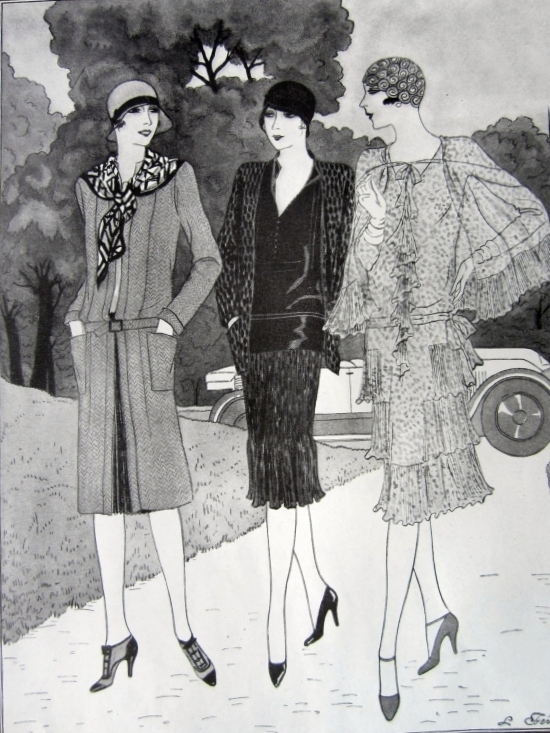 “The Mode” July 1928: Three outfits from Hattie Carnegie. Delineator magazine. It was common practice for buyers from upscale stores like Bergdorf Goodman and Hattie Carnegie to attend the Paris collections, purchase couture models, and then duplicate them in the United States, using the same — or equally high-quality — materials for their made-to-order clients. 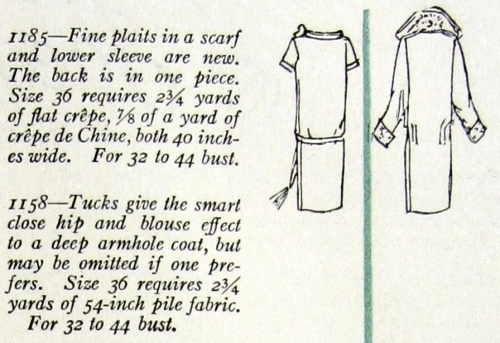 These copies cost about the same as the originals — but saved the client a trip to Paris for fittings. 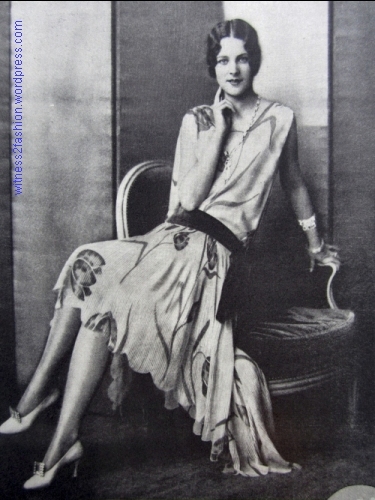 I showed this photo of a Hattie Carnegie dress in an earlier post.. There are many Hattie Carnegie costumes and accessories in the Metropolitan Museum Collection. 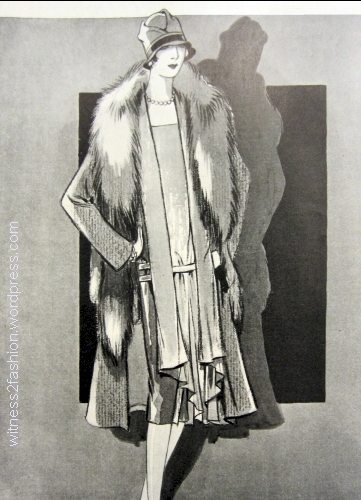 To see a Vionnet evening gown from Hattie Carnegie — it has a Hattie Carnegie label — click here. For the Met’s collection of more than one hundred Hattie Carnegie items, click here. 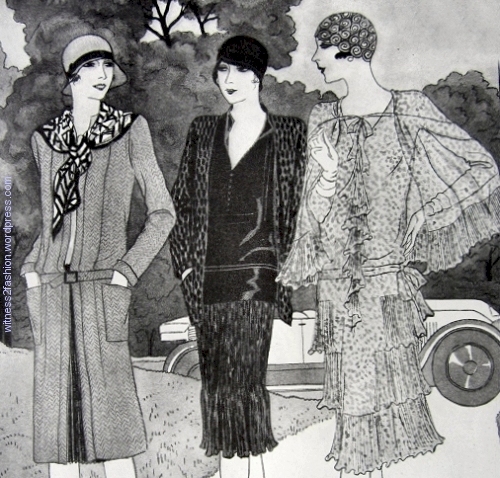 Details of three outfits from Hattie Carnegie, July 1928. 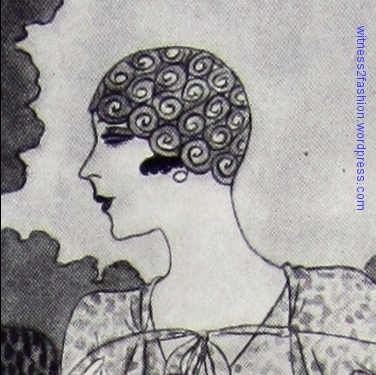 “The hat of coils of very pliable straw fits the head as closely as a transformation.” July 1928. Delineator. 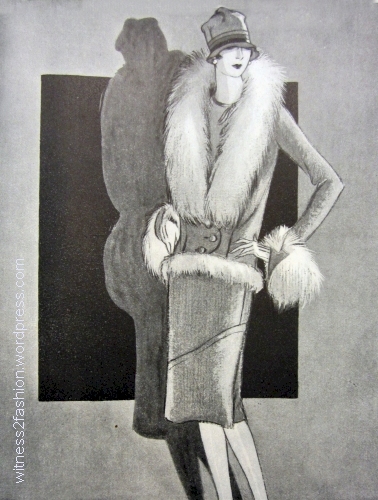 “The situation among American buyers in Paris during the years I worked there [1925 – 1928] was very simple. As a buyer of expensive French models for American mass production, you stole what you could and bought what you had to.” Fashion is Spinach, by Elizabeth Hawes, paperback, pp. 52-53. 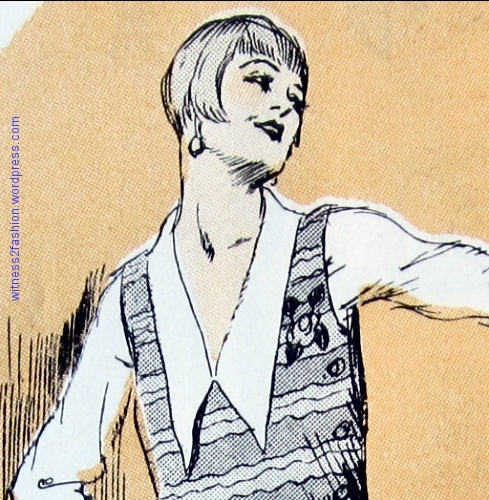 Embroidered flower on sleeveless dress by Nicole Groult; Delineator sketch, Oct. 1923. The Met has a charming embroidered cloche hat with a Nicole Groult label; click here. The “Tarts” dress by American designer Elizabeth Hawes, 1937. Photos courtesy of Metropolitan Museum. 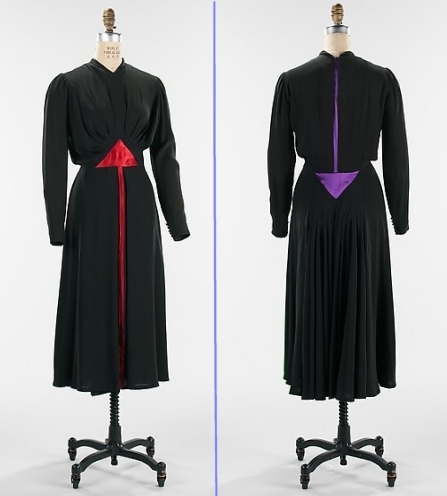 In spite of her joking title (the arrows point to the breasts and the buttocks), this dress would really flatter a normal woman’s figure, and its red and purple geometrical color blocks remind me of some Yves Saint Laurent dresses from 1966-67. Although it looks black, it is actually a very dark green. 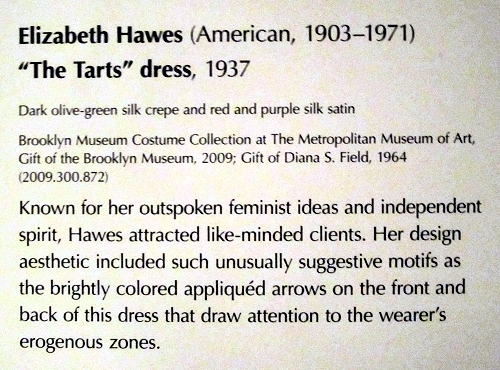 The museum docent told us that Hawes’ Tarts dress cost $375 in 1937. It was made in America, but it was custom couture. The Metropolitan Museum has a large collection of made-to-order Designer clothing by Elizabeth Hawes. Click here to see over sixty examples of her work. Her book, Fashion Is Spinach, has been reprinted by HardPress Publishing and is available in paperback, or as an E-Book from various sources.